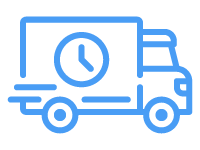 In the case of urgent deliveries we can offer trucks equipped with two drivers. In this way, the truck can travel almost 17 hours a day, which means that the journey time is reduced to almost half. These services must be scheduled in advance in order to organize them properly. Express Transportation in mini-Tir or vans: For merchandise of up to 1000 or 1200 kg., an exclusive small truck is rather used: It will carry out a door-to-door freight (without handling) and in a very short time, since said trucks do not have any driving limitations (no tachograph). Occasionally we can place semi-trailers with M.M.A of up to 7,500 kg. with a payload of up to 3,000 kilograms. These trucks are also faster than a 40-tonne trailer of M.M.A since they can run during the weekend. Although, unlike mini-Tirs and vans, they do have a tachograph that limits their daily driving time.